(L to R) Joel Simon, director of the Committee to Protect Journalists and Charles Lewis, founder, International Consortium of Investigative Journalists and co-founder of the Investigative Reporting Workshop at American University. 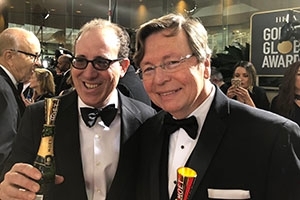 In an era when the news industry is under intense political and economic pressure, the Hollywood Foreign Press Association (HFPA) has donated $1 million to the International Consortium of Investigative Journalists (ICIJ), which American University School of Communication (AU SOC) Professor Charles Lewis accepted on behalf of the ICIJ during the 75th Golden Globe Award Ceremony on January 7. The HFPA also provided a $1 million grant to the Committee to Protect Journalists (CPJ) during the ceremony, which took place in Beverly Hills, California. Lewis, executive editor of the Investigative Reporting Workshop, based in SOC, founded the ICIJ in 1997 as a project of the nonprofit Center for Public Integrity, which he also created. "I am deeply grateful to the Hollywood Foreign Press Association and its president, Meher Tatna, and her incredible staff," Lewis said. The ICIJ - comprised of more than 200 journalists from 100 media organizations in 70 countries around the world - has carried out 27 investigative projects. The ICIJ made global headlines in 2016 with its year-long Pulitzer-Prize winning Panama Papers project, which analyzed more than 11.5 million leaked documents and exposed a shadowy network of offshore tax havens that allowed hundreds of politicians, celebrities and organized criminals, among others, to conduct questionable activity under a veil of secrecy. Last November, the ICIJ followed-up the Panama Papers project with the Paradise Papers, which emanated from more than 13 million leaked documents and detailed the "offshore interests and activities of more than 120 politicians and world leaders, including Queen Elizabeth II, and 13 advisers, major donors and members of U.S. President Donald J. Trump's administration." "It has been a joy to watch the evolution and success of the ICIJ these past two decades," Lewis said. "Congratulations to the outstanding staff and the hundreds of investigative journalists collaborating across countries and oceans." SOC, which is celebrating its 25th anniversary this year, traces its roots in journalism back to 1926 when the university launched its first news writing course. Today, the school's journalism division offers extensive courses in investigative reporting, such as the Investigative Journalism Practicum in which students work on long-form projects with publications like The Washington Post and Data-Driven Journalism, which teaches students how to strategically use spreadsheets, databases, programming, and data visualization in a journalistic context. Additionally, professors such as Bill Gentile, typify the kind of work for which the CPJ received its million dollar grant from the HFPA. Gentile's latest project "Freelancers," highlights the great personal risks reporters face to shed light on critical social, political, and economic stories from around the globe. Lewis said he first learned about the possibility of a donation when he received an unexpected call from Sandra Cuneo of the Hollywood Foreign Press Association while he was driving to Delaware to visit Dorothy, his 92-year-old mother. "It's one of those things where you need to pull off the road," Lewis said. Going to the awards ceremony was an added bonus. "I have been to many fancy awards dinners of all kinds over the years, but Sunday night was a wild and crazy affair like no other I've ever attended," Lewis said. "And it was great fun to see a few old friends and colleagues, including Joel Simon, the executive director of the vitally important Committee to Protect Journalists (CPJ), which is also receiving a $1 million contribution from the Hollywood Foreign Press Association." The CPJ will use the donation to "strengthen their international network of correspondents." "Journalists are under tremendous pressure these days, and around the world a record number are in prison for doing their job. The best journalism exposes wrongdoing and demands accountability," Simon said in a statement. "We must stand together as professionals and as part of a global community to defend the rights of journalists who confront the powerful, wherever they may be." The Hollywood Foreign Press Association has donated nearly $30 million to nonprofit organizations and film schools over the past several years. This original version of this post by Josh Benson was originally published on the Investigative Reporting Workshop's blog.